Coffea, commonly known as Coffee Plants, is a genus of flowering plants whose seeds, called Coffee Beans, are used to make various coffee beverages and products. They are shrubs or small trees native to tropical and southern Africa and tropical Asia. Coffee ranks as one of the world’s most valuable and widely traded commodity crops. Considered to be among the easiest and hardiest of houseplants, Coffee Plant is great for both experienced or beginner gardeners. 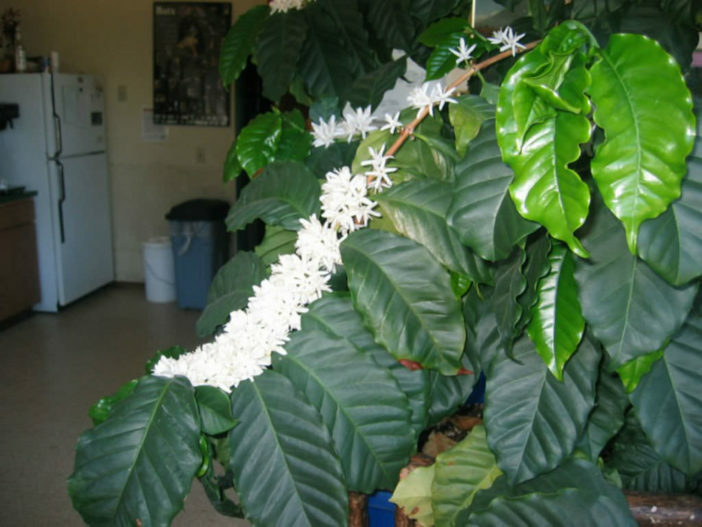 Not only is Coffee Plant care easy, but the plant itself is lovely and makes a wonderful addition to the home. Your Coffee Plant care routine can also include light fertilizing with a balanced fertilizer once every to 2 to 3 months in the spring and summer. Keep in mind that a happy Coffee Plant can grow up to 6 feet (1.8 m) tall. Therefore, provide enough space for the plant or make pruning a regular part of caring for your Coffee Plant. If you choose to prune your Coffee Plant, the best time is early spring. Repot your Coffee Plant every spring, gradually stepping up the pot size. Sow fresh seeds in spring. Cuttings are difficult to propagate, but you’ll have the best chance at success by taking young stems before they have hardened. The fruit are red when they ripen in the fall, with a sweet pulp surrounding the bean. Each Coffee Berry produces two beans. The Coffee Plants’s fruit does not all ripen at one time. In fact it will have blossoms and berries in various stages of ripening. Only the ripe berries can be picked. The berries cannot be picked when green since they will not ripen once picked.